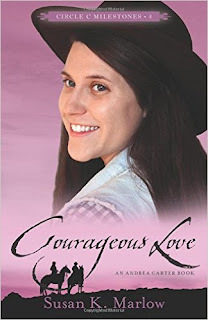 Courageous Love is the fourth book from Susan K Marlow's Young Adult series, Circle C Milestones. It is spring 1885 in San Joaquin Valley, California and Andrea "Andi" Carter is enjoying life. She enjoys helping on her family ranch, Circle C, racing and stunt riding her horse, Shasta, with the help of her lifelong friend and wrangler, Riley Prescott. Andi and Riley finds a cut in a fence where her brother's calves are held, not knowing things are about to get interesting and even dangerous. At a family party, a brick is thrown through a window with a note attached warning to the family. This is followed by a fire and other danger ahead for Andi and though she loves. Who will come to her rescue before it is too late? Courageous Love is targeted for the young adult audience, but that does not mean a middle-age reader, like me, would not enjoy it. Which I did! The action, adventure, and suspense kept me on the edge of my seat. I could not help to keep turning the pages to see what would happen next. I have been following Andi from the start and she still manages to make me giggle with her antics. The ending has quite a surprise I did not see coming at all! I loved it! I received this book from the author but was not required to write a review. This review is of my own honest opinion. Follow me on Bloglovin, Facebook, Pinterest, Twitter, GFC or Email.